It remains unclear if Mehboob Senior himself operated the gambling den. The investigation is underway. Kalupur Police discovered the gambling den on the first floor of the building. Among the arrested men was Aslam Mansoori, who allegedly had organized the gambling session. Popat Thakor, Mohammad Yasin Tokanwala, Tushar Patel and Javedali Saiyad were the other arrested gamblers. Police officers seized cash and several other items with a total value of Rs51,000 during the raid. The Ahmedabad Municipal Corporation had ordered to stop the construction, which has resulted in an unfinished building. Congress party members used the ground floor of the building as a meeting place, according to local media. 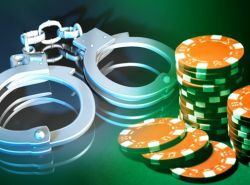 Those reports have sparked rumors about a possible connection as the illegal gambling den was located on the first floor of the same building. Last month, another illegal gambling house was busted in the Nashik District (Maharashtra).